In 7 years of doing Burger Weeks, I’ve never put together an event that wasn’t around a Burger made with ground beef. Then I spoke to Jason Hicks from Jones Wood Foundry. He suggested we do a British themed Burger Week event and my first answer was one of hesitation. 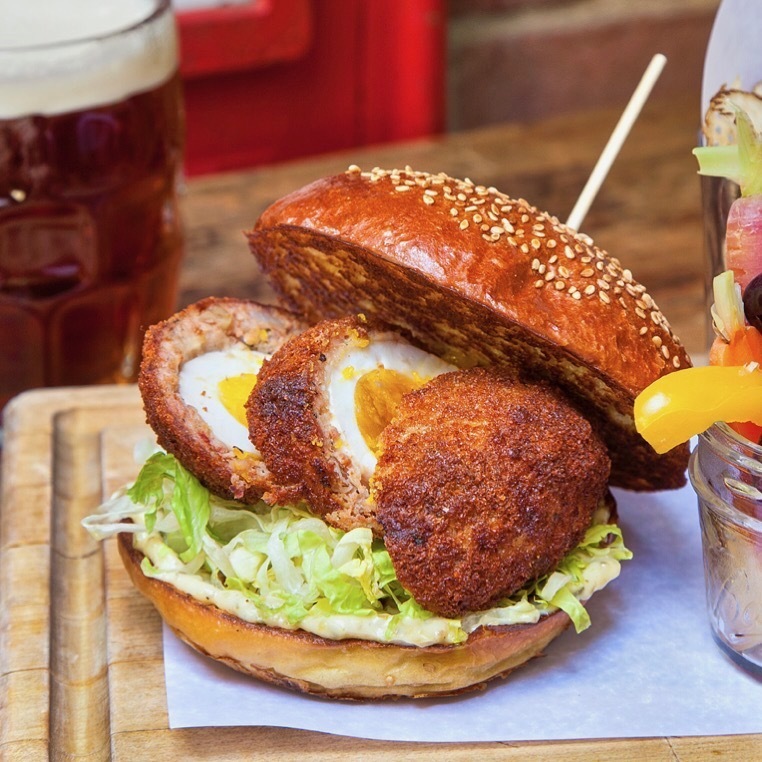 Then he told me that from time to time, they serve a Scotch Egg Burger and that was all I needed to hear! If you’ve never had a Scotch Egg, let me tell you, its a special , special food item. First you take a hard-boiled egg, wrap it in sausage meat, coat it in bread crumbs and then, you deep fry it or bake it. They aren’t very common in the United States but there everywhere in England. The thing about Scotch Eggs is that the bad ones are bad but the good ones, well they are amazing. 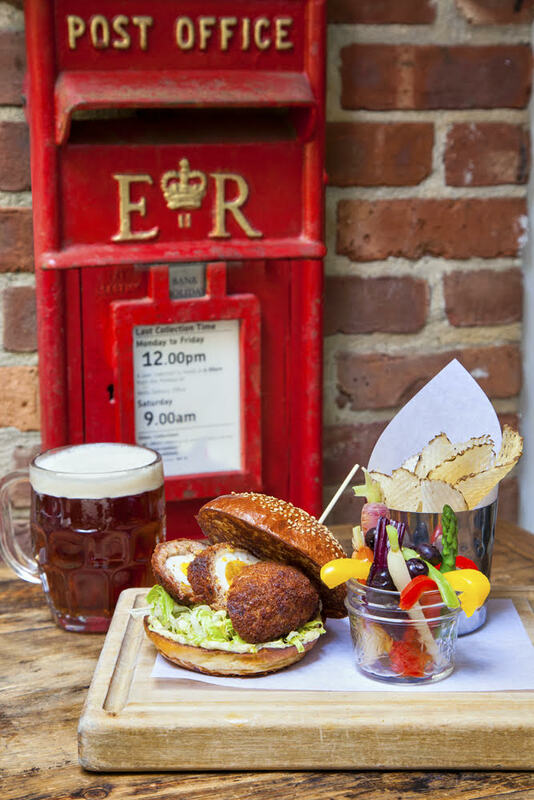 I asked Jason if we could go over the top with our British themed Burger night and he said “let me call you back.” When we spoke a little while later, he had come up with one of the most unique meals we have ever served during NY Burger Week. 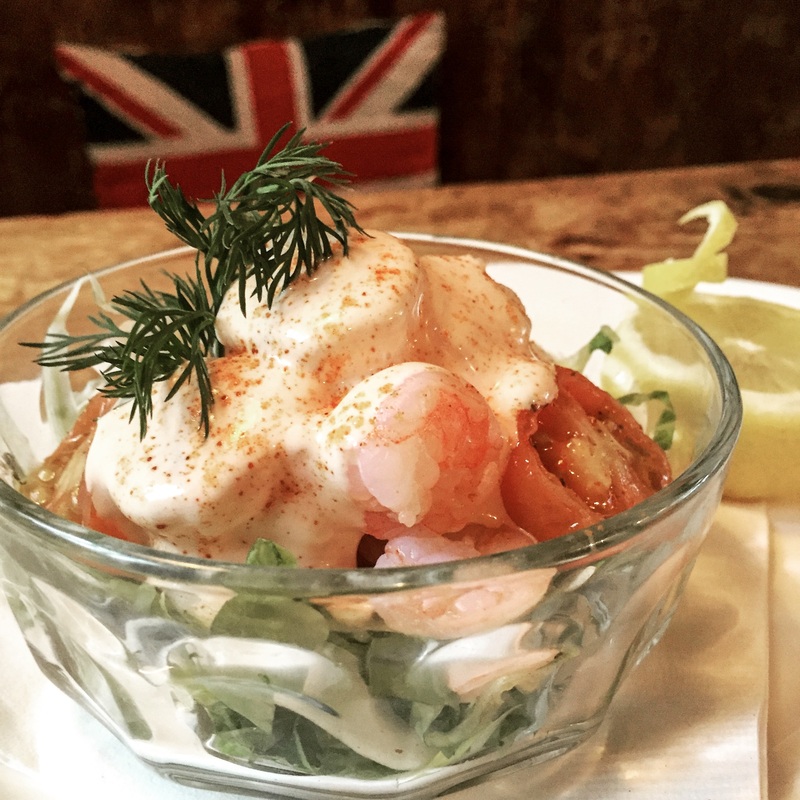 Not only was I excited about the meal, but JWF is a great British themed pub where they have truly put a spotlight on British food to showcase it as the comfort food of a nation. Its a great place and we had a great event. 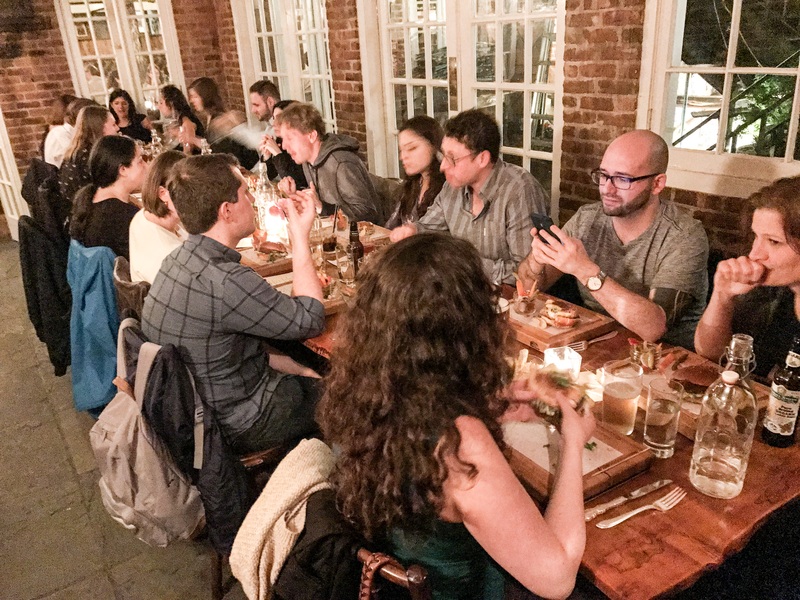 Sometimes a NY Burger Week event takes us on a journey, and for this one, we are going all the way to the Upper East Side AKA New York Britain. Enter into Jones Wood Foundry, a traditional British taproom with some classic pub food & a big draft beer selection. But tonight will not be like any jolly old night. Tonight we will become Hangrylophiles (that’s hangry + anglophile)! The lads and lasses at Jones Wood Foundry have put together a British dining experience for NY Burger Week the likes that we’ve never seen. 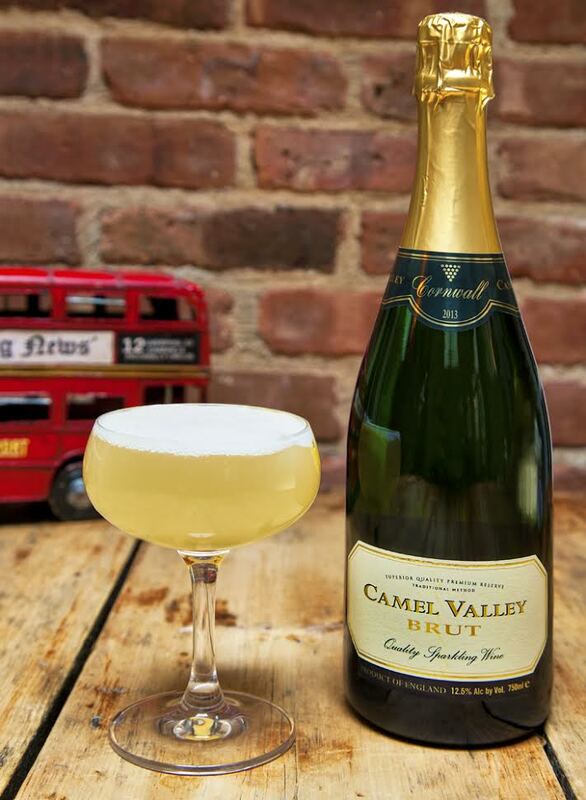 We’ll all get friendly at a big communal table with a lesson on how to make a British Fizz cocktail. Then you can taste it or you can choose to have a Cask ale. From there you’ll get a choice of two very English apps, a prawn cocktail or a chicken sausage roll. 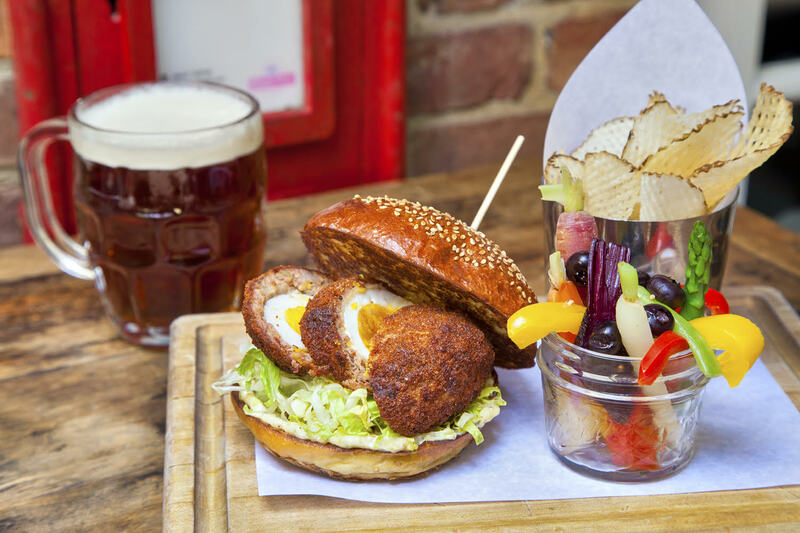 No matter what you choose, the night will culminate when you sink those chompers into a ScotchEgg Burger! Wow. That was awesome. Not only was it a completely unique event but it was a seriously great time that ran exceptionally smoothly thanks to the fantastic staff at Jones Wood Foundry. Thanks to Jason and everyone there for giving top notch service. Thank you to Shari Bayer at Bayer PR for not only making the intro into the Jones Wood Foundry but for supporting the event (and all of NY Burger Week!) with some PR assistance. Could not have done it without you! Thanks to special guests Skinny Pig NYC, ThisGirlCanEat and the BurgerBabez for supporting the event and coming out to have a good time. And last, but NEVER least, thanks to everyone who came out to the dinner and had a great time. 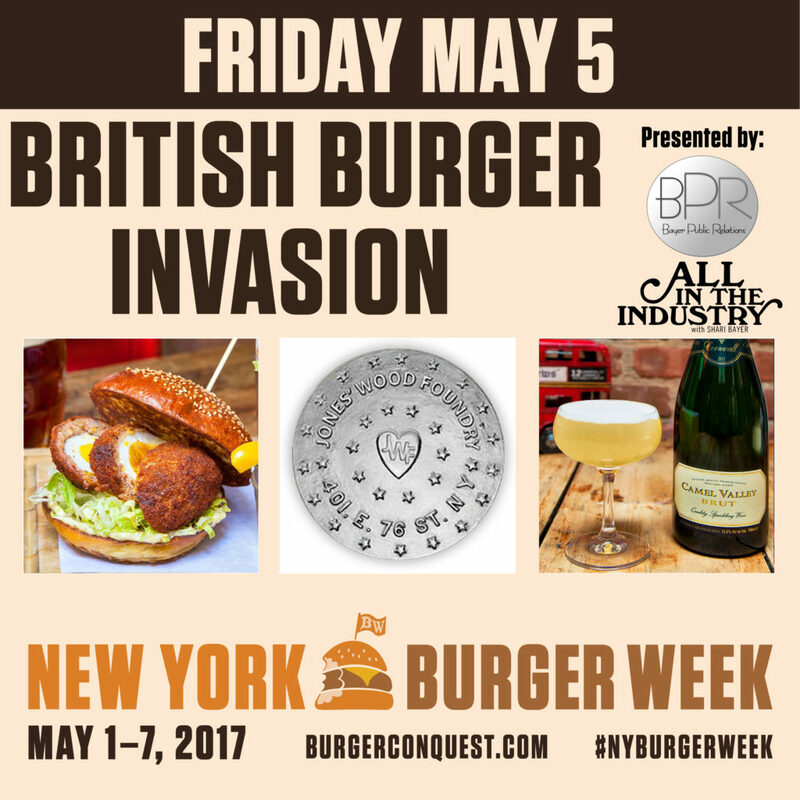 This entry was posted in Burger Week, Burgers, New York, NY Burger Week and tagged All In The Industry podcast, Bayer PR, jones wood foundry, NY Burger Week, NY Burger Week 2017, rev ciancio, Scotch Egg Burger. Bookmark the permalink.